The National Energy Board has received 1,805 applications to participate in the hearing for TransCanada Corp.'s proposed Energy East Pipeline, including one from the New Brunswick government. The board is now evaluating the applications to decide who will be granted participation rights, and whether it will be as an intervenor or commenter, spokesperson Katherine Murphy said in a statement. 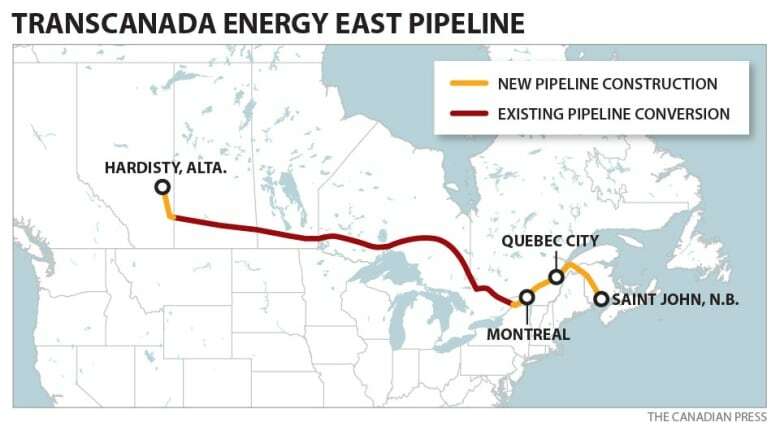 TransCanada's proposed Energy East pipeline would ship crude from Alberta to New Brunswick. (Canadian Press)For people to participate in the hearing process, they "must be directly affected or have relevant information or expertise," according to the NEB's website. TransCanada Corp. wants to use a combination of existing pipelines and new construction to carry more than a million barrels of crude oil a day 4,600 kilometres across the country from Alberta to export terminals in Quebec and New Brunswick. As part of the proposed $12 billion project, TransCanada plans to construct 500 kilometres of pipeline in New Brunswick from the Quebec border to the Irving Canaport facility, which is located at the entrance to Saint John Harbour. The New Brunswick government wants "the ability to have input regarding the terms and conditions to be included in any recommendation or approval the National Energy Board may issue for the project," according to its application, dated Feb. 27. "The Government of New Brunswick (GNB) will be directly affected by the project as GNB is responsible for the administration and enforcement of several Acts and Regulations that will apply to certain aspects of the Energy East Pipeline Project (e.g., Clean Environment Act, Clean Water Act, Clean Air Act, Crown Lands and Forest Act, Heritage Conservation Act, Public Health Act, etc. )," the application states. "Also, GNB administers and controls provincial Crown land, which accounts for approximately one third of the land on which the proponent is proposing to install its pipeline in New Brunswick." In addition, the government has representatives who have relevant information and expertise in several fields related to the potential environmental and socio-economic effects of the project, including, but not limited to, air quality, groundwater and surface water quality, wetlands, climate change, flora and fauna, agriculture, archaeological resources, Aboriginal interests, health and safety, contingency planning, and emergency response, according to the application. Pierre Doucet, project manager with the Department of Environment and Local Government, and solicitor William Gould, are listed as the government's authorized representatives. The Conservation Council of New Brunswick was also among those who applied for intervenor status by Tuesday's deadline. "It's extremely important that we have New Brunswick voices in the form of landowners and directly affected people, but also in the form of professional organizations and folks who can speak on behalf of the broadest of environmental issues in New Brunswick, like our waters and the Bay of Fundy," said Stephanie Merrill, who directs the council's freshwater protection program. "The main concern is how the [proposed] project contributes to increasing our dependency on fossil fuel infrastructure, especially given how New Brunswick is really falling short in our climate greenhouse gas reduction targets and that we have to do some big actions to be able to meet those commitments — and that certainly doesn’t include increasing our dependency and building brand new fossil fuel infrastructure," she said. The National Energy Board is still reviewing the Energy East application to determine if it's "sufficiently complete," said Murphy. "If the board determines that the application is sufficiently complete, it will issue a hearing order along with the list of participants. If this is the case, we would anticipate these documents to be released mid-year 2015," she said. The hearing order will outline how the review will take place, the roles and responsibilities of participants and any associated timelines, said Murphy. A report from the Council of Canadians released in August says the Energy East Pipeline would cross and endanger 961 waterways that are important for drinking water, First Nations cultures and treaty rights, fish and wildlife habitat and tourism. That includes 300 waterways in New Brunswick. TransCanada hopes to begin construction in 2016, with the first oil deliveries to arrive in New Brunswick in 2018. The pipeline is expected to create approximately 2,300 direct and indirect jobs in New Brunswick over the span of the project.